Wash and trim the frisée into bite size pieces. Remove the skin and pith from 4 of the blood oranges and slice crosswise ¼ - inch thick. Lay the orange slices in a single layer on a baking tray and set aside. Juice the remaining blood orange into a mixing bowl and add lemon juice and sugar; slowly whisk in canola oil and season with salt and pepper. Adjust the oven rack as close to the heating element as possible and heat the broiler on high. Drizzle olive oil over the blood orange slices and season with salt and pepper, broil the orange slices about 5 minutes, just until they start to caramelize. Cool to room temperature and arrange on the bottom of a serving tray or on individual plates. 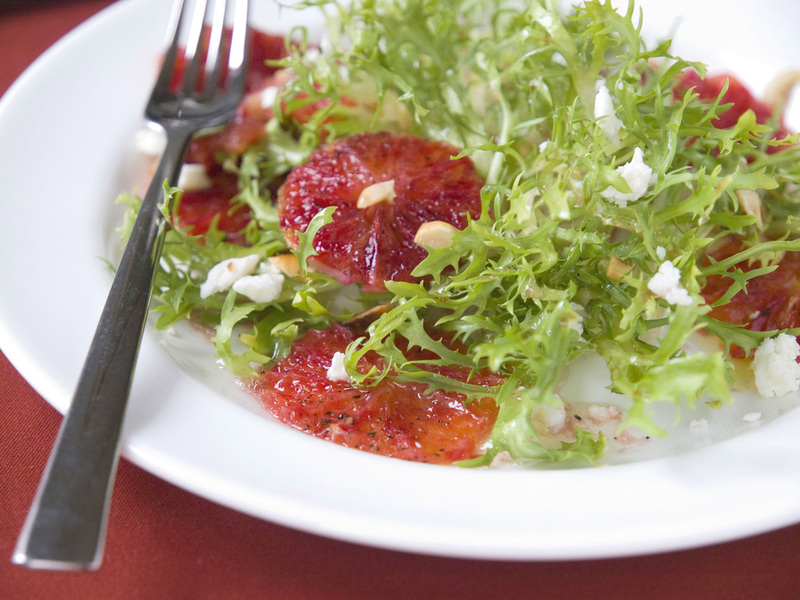 Dress the frisée in a large mixing bowl with the blood orange vinaigrette and arrange on top of the roasted oranges. Sprinkle with hazelnuts and feta.